High Pressure Fogging is the answer for maintaining the perfect climate in your greenhouse. Plants regulate their temperature by evaporation of water through their leaves. This process of temperature regulation uses energy. This energy could be better used – by more vigorous growth. Proper regulation and maintenance of greenhouse temperature helps plants reach optimal growth, by preventing water stress, and tissue damage. 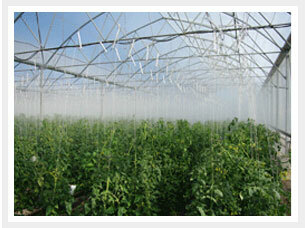 High pressure fogging provides precision greenhouse temperature control through evaporative cooling. Mechanical cooling systems (air conditioning or refrigeration) are cost-prohibitive in commercial greenhouse environments. 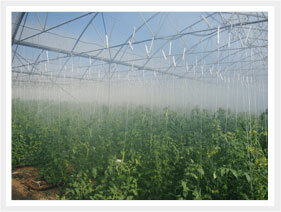 However, high pressure fogging gives you an affordable, yet highly effective method of greenhouse cooling. High pressure fogging also provides a more even distribution of your greenhouse cooling (because the air is cooled throughout the whole greenhouse) This also is beneficial to optimal plant growth because of a more stabilized humidity level. 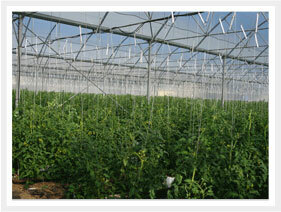 Mistafog are your experts in Greenhouse Cooling – through High Pressure Fogging. Fogging systems – without question– are the most effective and uniform method of greenhouse cooling and can achieve temperature drops up to 10oC in un-shaded, and 15oC in shaded greenhouses. High Pressure Fogging Systems produce very small droplets of water (around 10 microns) which stay suspended in the air until they evaporate. This greenhouse is 4000 square meters and even though it is equipped with automated opening roof panels for cooling the temperature regularly rises above 34 deg Celsius. As the fog starts to appear the air at the higher levels is cooled. The controller would normally cycle the system to keep the temperature at the desired level. The fog cools the air at the higher levels nearest the misting nozzles and the cool air drops to the level of the plants. The hotter air then rises to be cooled by the fog. This continuous air cycle provides even temperature distribution over the crop. The fog would normally be controlled to keep it just above the crop but by switching to manual operation more extreme fogging can be achieved. Extreme fogging can be used to disperse some suitable insect control products. Fogging gives even and complete coverage as well as cost and time savings over manual spraying. These droplets are too heavy to stay suspended in the air. The increased droplet size causes poor evaporation, reduced greenhouse cooling effectiveness, and a significant, dangerous wetness in the greenhouse. High Pressure Fogging operates at over 700psi – and produces droplets as small as 10 microns: providing optimal greenhouse cooling and temperature control. At this size the droplets flash evaporate, eliminating water collection. These tiny droplets flash evaporate – cooling the area where the most heat is. The cool air then travels down to the crop level, to be replaced by the hot air rising. The convection air currents ensure even temperature distribution throughout the crop – eliminating the need for fans. above 34 deg Celsius. As the fog starts to appear the air at the higher levels is cooled. The controller would normally cycle the system to keep the temperature at the desired level. The fog cools the air at the higher levels nearest the misting nozzles and the cool air drops to the level of the plants. 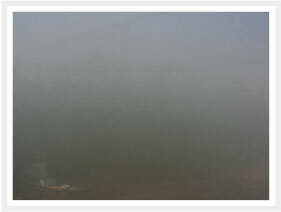 The hotter air then rises to be cooled by the fog. This continuous air cycle provides even temperature distribution over the crop. The fog would normally be controlled to keep it just above the crop but by switching to manual operation more extreme fogging can be achieved. 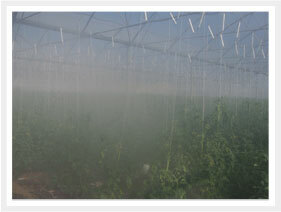 Extreme fogging can be used to disperse some suitable insect control products. Fogging gives even and complete coverage as well as cost and time savings over manual spraying.